This Sunday, the Fourth Sunday of Easter, is traditionally called Good Shepherd Sunday. The name derives from the gospel reading for the day, which is taken from the tenth chapter of St. John's Gospel. In John’s Gospel, Christ is described as the "Good Shepherd" who lays down his life for his sheep. Good Shepherd Sunday also marks the World Day of Prayer for Vocations. The purpose of this day is to publically fulfill the Lord's instruction to, "Pray the Lord of the harvest to send laborers into his harvest" (Mt 9:38; Lk 10:2). I encourage you to please continue to pray that more young men and women hear and respond generously to the Lord's call to the priesthood, diaconate, religious life, societies of apostolic life or secular institutes. While the Church appreciates all vocations, She concentrates Her attention today on vocations to the ordained ministries (priesthood and diaconate), to the Religious life in all its forms (male and female, contemplative and apostolic), to societies of apostolic life, to secular institutes in their diversity of services and membership, and to the missionary life. Fr. Eric Bennett of the Archdiocese of Boston celebrates Mass. Father is a native son of Our Lady of Mercy Parish where his parents and family still continue to worship. At Our Lady of Mercy Parish we have been truly blessed to have vocations come from our parish family. Two priests, Fr. Eric Bennett of the Boston Archdiocese and Fr. 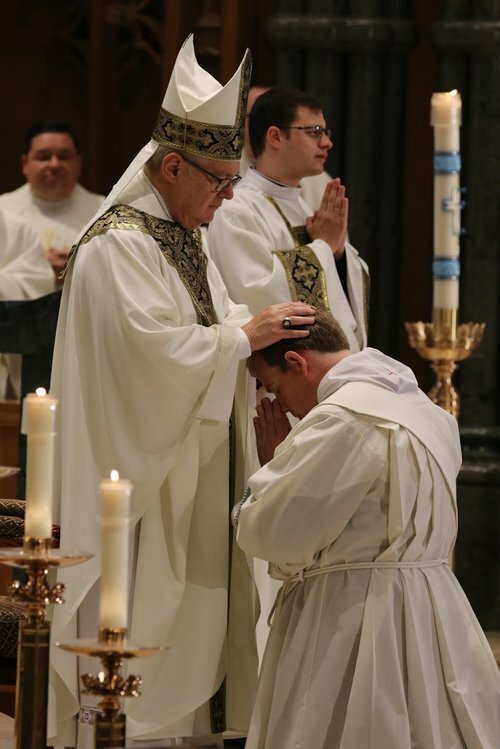 Brian Morris of the Providence Diocese were recently ordained priests. Both these fine priests grew up in our parish and had their vocation to the priesthood nurtured here at OLM. In fact, their families still worship here. The Sisters of St. Cecilia in Nashville, TN. We are also blessed to have a young woman from OLM who is graduating from Providence College this year who is to enter the Dominican Sisters of St. Cecilia in Nashville this fall. This congregation of religious sisters is booming with young and holy women eager to serve Christ and His Church. Each one of us is still called to continue to foster vocations to the priesthood and religious life at OLM. We must do so by praying for more vocations to the priesthood and more vocations to the consecrated life in the Diocese of Providence. Our culture is full of distractions and very often God’s call to the priesthood and consecrated life is lost amidst the loud cries of our secular and materialistic society. Bishop Thomas Tobin of Providence ordains Brian Morris a priest in June 2017 at the Cathedral of Saints Peter and Paul, Providence, RI. We can help this effort to increase priestly and religious vocations with our continued prayers and by encouraging young people especially within our own families and in our parish family to consider a vocation to the priesthood or religious life. Remember that prayer, encouragement and support are needed if we are too drown out the noisy secular world around us and let God’s call be truly heard. Bishop Tobin recently said to the priests of the Diocese of Providence, "Please pray fervently for and work deliberately for more vocations to the priesthood in the Diocese. Of course a priestly vocation originates in the heart of God, but it is nourished in our homes, parishes and schools. You and I were inspired by priests we’ve known and loved. The same is true for future priests; they will be inspired and encouraged by us! God said: “I will give you shepherds,” and I believe Him." On this Good Shepherd Sunday let us heed the Bishop’s call to pray fervently for more vocations for the Church of Providence. Pray, encourage and support vocations! Do good. Be well. God Bless. Go Sox! !